July 25th in Wordpress Plugins by Wordpress Jedi . Many of us use Photoshop and other photo editing tools to create and optimize graphics for our websites. Thanks to plugins such as Coverich Editor, you can do most of the work on your website. This image editing tool has slideshow, GIF, and stitch features, allowing you to turn your images into GIFs quickly. The Coverich Editor comes with hundreds of Font Awesome icons and Google fonts. It allows you to draw lines, crop images, blur photos, and use layers to enhance your images. Want to create social media covers or ads? no problem. You can also export and share your canvas with others. 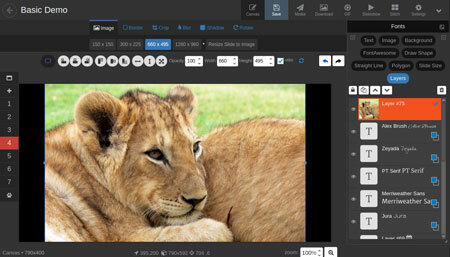 Coverich Editor gives you many features you would expect from a decent image editor. For instance, you can redo/undo changes, move elements via drag, and create GIFs faster. This is a commercial CodeCanyon plugin.